Persicaria is derived from the Latin name persica which means peach and refers to the genus Polygonum persicaria, because the leaves look like the leaves of the peach tree. The common name of Polygonum persicaria is redshank or lady’s thumb. The new Latin name is Persicaria maculosa and is derived from the Latin word mâcula which means: blotch; full of blotches; variegated. Polygonum is a Latin transcription of the Greek plant name polugônum. Some scientist say that polugônum comes from the Greek words polus which means many and the word gônu which means node or joint, so a polygonaceous plant. Others say: the meaning of polugônum refers to the 2nd composition of the name: gônos which means: offspring. If this would be true, the name Polygonum hints to the numerous fruits or seeds which Polygonum tends to bring forth. Persicaria maculosa(Polygonum persicaria) is a weed and indigenous in many countries. It grows well in moisture-retentive, fertile soil of fields; roadsides; verges of canals and ditches. The genus Persicaria consists of about 150 species which are distributed throughout the entire world. Many are too vigorous and weedy. The genus includes a few woody species as well. There is quite a big difference in habits of growth between the species. There are many dwarf ones, having creeping stems, the so-called ground covers, but also vigorous high species and even aquatic and marsh plants. Nowadays growers and landscapers only work with 5 or 6 species of which Persicaria amplexicaulis is by far the most important one, also in breeding. Persicaria affinis(Polygonum affine) still is a popular one. In my garden I have the cultivar Darjeeling Red. It is a very floriferous one and blooms from June till the first frost and gives us each year a lot of pleasure. Persicaria affinis is indigenous in Nepal and was, for the first time, imported in the United Kingdom in 1845. It has a creeping rhizome and forms on the soil surface a carpet of smooth; narrow; lanceolate green leaves, bronzing in Winter. Darjeeling Red has rose-red flowers on a 25cm stem. Recommended companion plants are: Anemone japonica Honorine Jobert; Campanula macrantha and Campanula trachelium. Persicaria affinis is quite a vigorous grower. It is advised to rejuvenate the plants when aging. Persicaria bistorta(polygonum bistorta) The common name is Snakeweed. Bistorta derives from the Latin words bi and tortus. Bi means: double or two times; tortus means: curve. The rhizome often shows a double curve like a creeping snake. Persicaria bistorta is an ideal plant for planting on ditch-sides as the snaky, convoluted root stocks, constantly re-produce new runners which strengthens the ditch sides of ponds and canals. It blooms from June till September. Combine Persicaria bistorta with other moisture-loving plants like Trollius; Iris siberica and Iris pseudocoris. Persicaria virginiana(Polygonum filiforme) filiforme derives from the Latin words filum which means: thread and forma which means: shape. filiforme = thread shaped. Virginia. Virginia derives from the Latin words virgo or virginis which means: virgin. darker corners like a beacon. Persicaria amplexicaulis, for sure, is the most popular species among landscapers; garden architects and Persicaria lovers. Breeders put all their efforts in getting better colours, thicker flower-spikes; sturdier stems and so on. Some of them are quite successful and it is remarkable that it are just the landscapers and garden architects who are active in breeding Persicaria as they know the valuable use of this perennial in City Greening; Public Gardens as well as in private gardens. Persicaria amplexicaulis are easy growing plants, mostly flowering in late Summer and very suitable for plantings on places in parks and gardens where hardly something will grow. The best colourful effect and border diversity is reached by planting Persicaria amplexicaulis in big groups of plants combined with Miscanthus as a companion plant. Amplexicaulis derives from the Latin words amplecti and caulis. Amplecti means: enclose and caulis means: stem, so: stem enclosing. Persicaria amplexicaulis Roseum is an old, but still valuable cultivar and is in no way inferior to new(er) varieties having flashy and snazzy names. It is an upright, sturdy growing plant. It blooms in the Summer with soft pink spikes which tend to become hot pink when temperature changes. Persicaria amplexicaulis Pendula. It is named Pendula because of its hanging flowers. The spikes are ticker compared to other Persicarias. The colour is dark red. It is an elegant 60cm high plant, producing all Summer a fountain of flowers. Persicaria amplexicaulis Inverleight. It is a dwarf among the Persicarias amplexicaulis, growing not higher than 40cm. The flower colour is deep red; the plant produces large quantities of flowers which makes this ‘mini’ form quite attractive in the garden. Perfect variety for display on pots and for garden designers/land scapers. The breeders and their varieties. The English nursery Rowden Gardens, owned by John Carter is well-know for its new Persicaria cultivars. In 1994 a Persicaria with very slim spikes and bright violet flowers arose as a chance seedling at the nursery. The very unusual seedling was named ‘Rowden Gem’. The famous nurseryman Mr. Coen Jansen bought a plant and used it for further breeding. As a result he got two new plants. One he named ‘September Spires’, having reddish violet flowers and broader spires than its parents. The other was named ‘October Pink’ The colour is darker pink than amplexicaulis Rosea. One day in 1996, Mrs. Yvonne Daw paid a visit to Rowden Gardens, bringing a specimen of Persicaria amplexicaulis which had emerged in her garden. The plant was a mutation or a sport having striking yellowish foliage. The plant was named ‘Cottesbrooke Gold’. Cottesbrooke is the village where Mrs. Daw lives. The unusual look of the pink flowers and the yellowish foliage attract many people. The well-known Danish Author of books about gardening, Mrs. Birgitte Husted Bendtsen says: I fancy that I belong to those who this one metre high plant attract like a magnet. I grow Persicaria amplexicaulis Cottesbrooke Gold with red leaved plants in my border with striking plants. 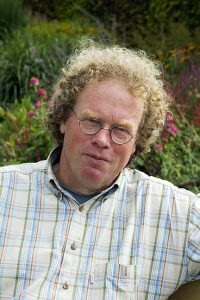 Another Garden architect, who has bred Persicaria, is Piet Oudolf. Piet might be the most famous and renowned Dutch garden architect of the world. He designed; constructed and did the lay-out of private estate gardens in Canada; Denmark; Great Britain and Italy. His most famous work is undoubtedly the design and lay out of ‘The Gardens of Remembrance’, part of ‘The Battery Conservancy’ located at the southern tip of Manhattan Isle in New York. The ‘Garden of Remembrance’ is located at the border of the Hudson River. Along the elevated portion of the promenade lies the 3500 square metre large garden. These vast perennial gardens pay tribute to; those who perished on September 11, 2001 when the twin Towers were destroyed by terrorist attacks. Piet Oudolf has designed these gardens. They were planted on May 8th 2003 with native grasses and flowering perennials. They embrace the waterfront, are in rhythm with the sea breeze, and delight the eye while greeting millions of annual visitors. The survivors of 9/11/01 may visit ‘The Gardens of Remembrance’, being a resting-place for those, seeking renewed optimism and hope. Piet is the breeder of 2 Persicaria amplexicaulis varieties, named Firedance and Summerdance. Firedance is a striking variety having light yellow/green foliage. Also the colour is spectaculair. The colour of the 20cm long flower spikes are intensive orange to soft pink. It is a vigorous spreading grower which will be an eye catcher in the garden if combined with contrasting dark-leave plants and grasses. Summerdance is often used by Piet in his designed waving and restful borders. The flower colour is cerise/red; the foliage is dark green. 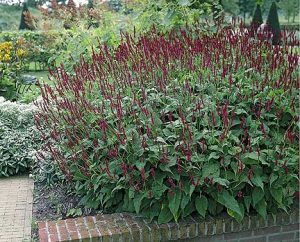 Persicaria Summerdance is a 80cm high, majestic upright plant, having sturdy stems which make this cultivar quite suitable for windy corners in the garden. Top Persicaria breeder, Chris Ghyselen. The readers might remember that I already wrote about the Belgium breeder ChrisGhyselen in my article about Brunnera. Chris is also a garden architect, like Piet Oudolf. His parents were medical doctors and got 9 children, 5 girls and 4 boys. Chris is just in the middle. All his brothers and sisters became medical educated, except him! Being a brought-up, Chris already was busy with making mixed bouquets of wild grassland flowers; catching butterflies etc. When he became 14 years old, his parents finally got aware that a horticultural training would be the best for him. 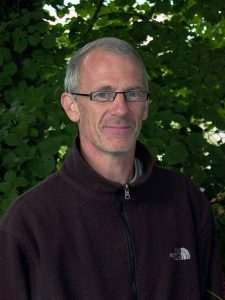 When he was 16, he attended the Horticultural College in the Belgium city Roeselare and later on the faculty in the Belgium city Vilvoorde where he got graduated as a garden architect. A very well-known Belgium garden architect, of whom he learned a lot, was André van Wassenhove(died in 2002). 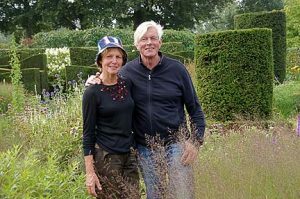 Also Piet Oudolf(see above) is very grateful for the lessons he learned from André. Chris, still continues breeding Persicaria. He says: ‘Persicaria Pink Elephant was for me a revelation as it was the first crossing of Persicaria amplexicaulis x another Persicaria species. It is my secret which species!! It is also my aim to breed a real/nearly black one. When I promised to write an article about Persicaria, I did not realize myself how hard it was to write anything meaningful about the subject Persicaria. It caused me quite a big headache, however, I grew into the subject step by step by talking to growers and breeders. It’s no wonder that it are just the garden architects, having a close bond with the nature, do love Persicaria. Persicaria does not demand special prepared soil; special fertilizers; chemicals to fight deceases or whatever, on the contrary. Persicaria amazes and rejoices gardeners for giving them so much pleasure without demanding something in return.